Alright, Ayn Randy the description, our inception, what are we about, what do we do, what do we play? Good question, we have often asked ourselves that and what have we come up with? Hecking not much friend, but I have some “flash” words from a brain storm I did! 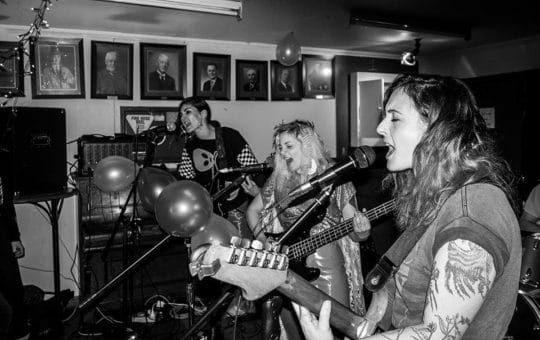 So here goes we play/are/like: Aotearoa punx, pop, garage-y, grunge-y, emojicore, DIY, dog lovers and one extreme cat lover, artist……kinda, see people, all rounder handy man/persons, indecisive, feminists, coffee, late, reliable, we like to party but also sometimes we like to stay in and do the washing and there is NOTHING wrong with that, we all need a break and the washing needs to be DONE. Ummm, skulls, memes, lots of memes, srsly LOTS OF MEMES, drink, fashion, capes, punctual, babes, weeds, cuddles, BOOM, that should give you an idea, maybe, kinda? I dunno, just come watch and yell your own flash words at us :) The history: we have been making songs together for nearly two years, we mainly started out from what most great thing start from, friendship and boredom! And have played shows in Wellington, Auckland and Whanganui, but talking about going further so maybe in like two years well make in down south or something. We self released a tape in May 2017, and have done a second run which you can order from our band base camp. Yeah!